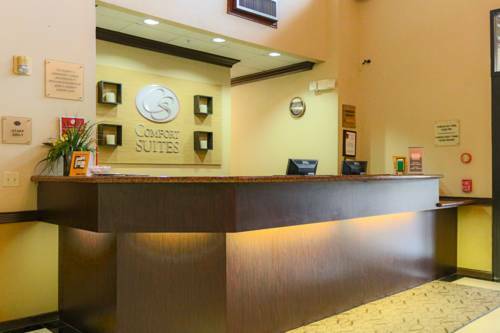 The smoke-free Comfort Suites Bush Intercontinental Airport hotel in Houston, TX near Six Flags SplashTown offers guests the extra space you need with the extras you want. Conveniently located right off Interstate 69, We are also near sites and activities like Golf Club of Houston, Greenspoint Mall, Sam Houston Race Park, University of Houston and NRG Park. Enjoy our free hot breakfast, free WiFi, free airport transportation, meeting space and a fitness center. Your spacious suite offers 25 percent more space than the traditional room, with amenities like a refrigerator, microwave, coffee maker and recharge device. Also, earn rewards including free nights and gift cards with our Choice Privileges Rewards program. We offer free parking for only during the nights stayed at the hotel. Additional night parking will be charged if leaving car at the hotel and flying out.